Whether we are entertaining for a large group of friends or just having a typical weeknight supper, you can be certain that the table is always set with proper tableware. 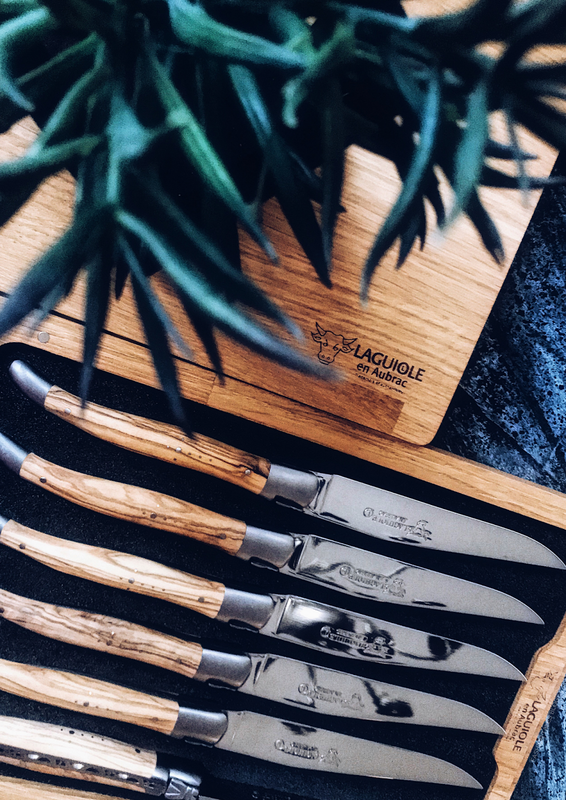 If you're a newbie to first-rate tableware, then let me introduce you to a company with humble roots, Laguiole en Aubrac, a renowned brand that specialises in fine cutlery. 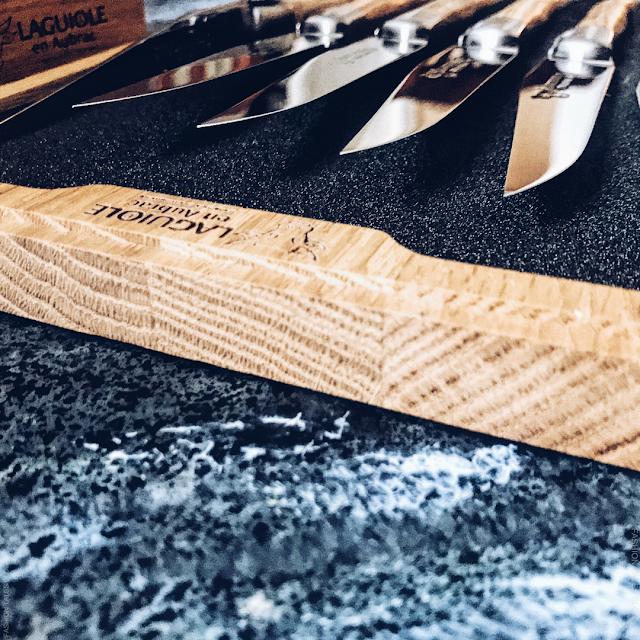 Laguiole has long been famed for their knives dating back to 1829 in Laguiole, a small village of the Aveyron (South of France) when the company's first farmer's knife was created. 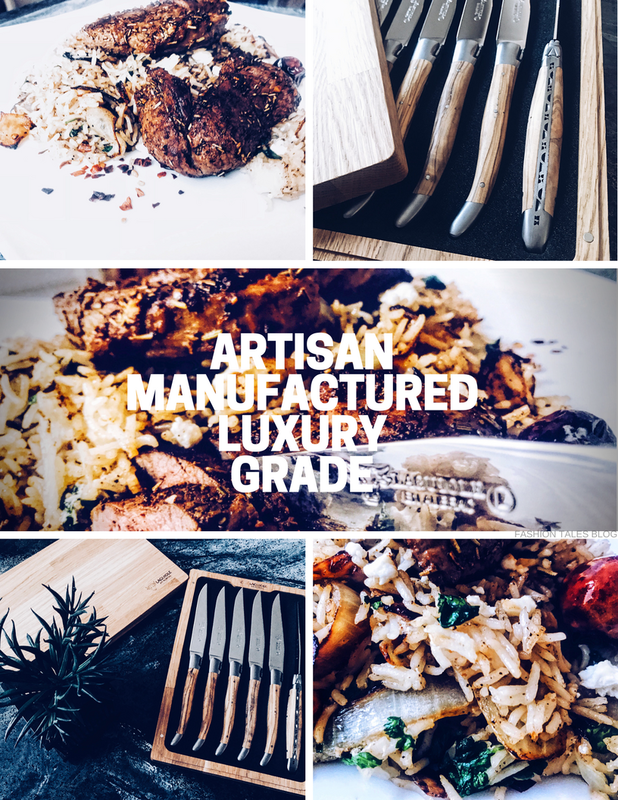 The collection includes a vast range of everyday use cutlery: steak and table knives, tableware sets, and kitchen knife blocks, amongst a sommelier line of foldable knives as well. 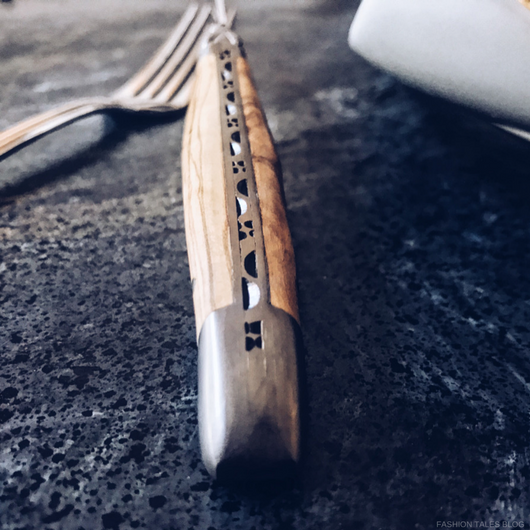 All of the work is hand-made, which gives each piece a special quality, and one that is specific to traditional French cutlery. 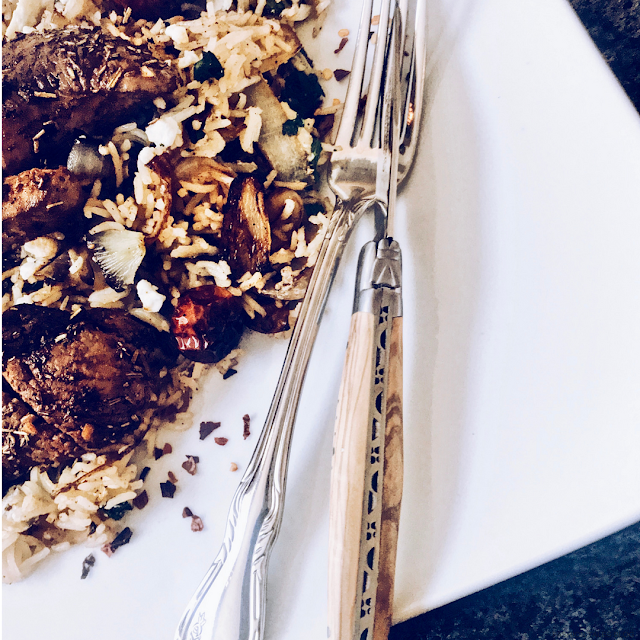 Don't be fooled if you think the mere thought of "table knife" is meant to be dull in strength or functionality … it is certainly not! The knives will cut your food beautifully. 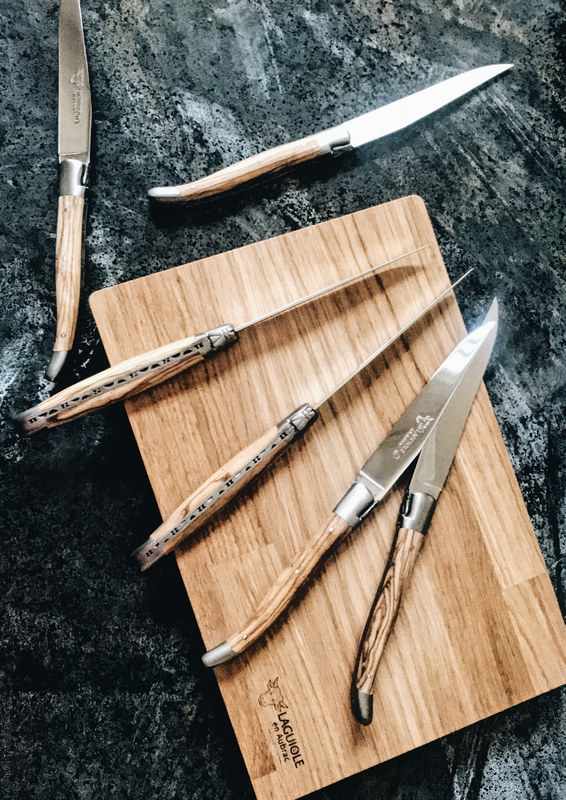 They're elegant and of great quality, and this style has stainless steel bolsters with olivewood. 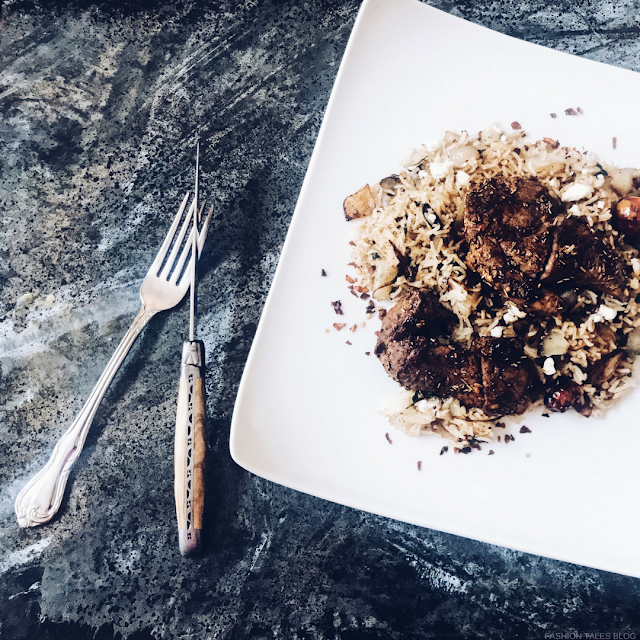 The Main: Grilled Moroccan lamb and North African vegetable rice. This particular six-piece set comes in a wooden branded box. 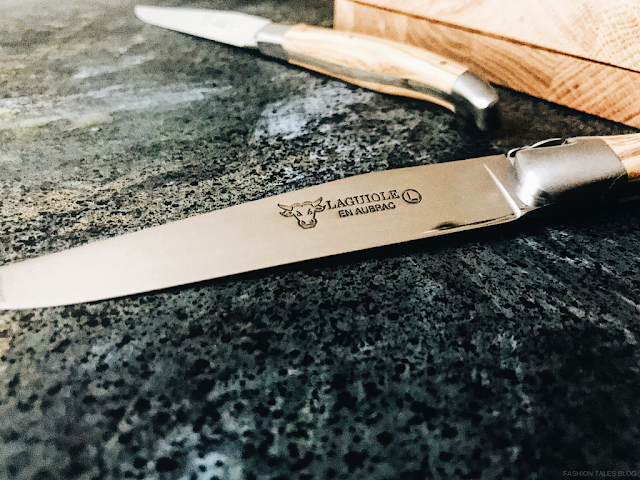 The knives are adorned with two matte polish bolsters with the signature Laguiole en Aubrac logo engraved centred along the spine (and just before the heel of the knife). The spring is polished on the inside and forged as one piece with the iconic bee/fly shape. 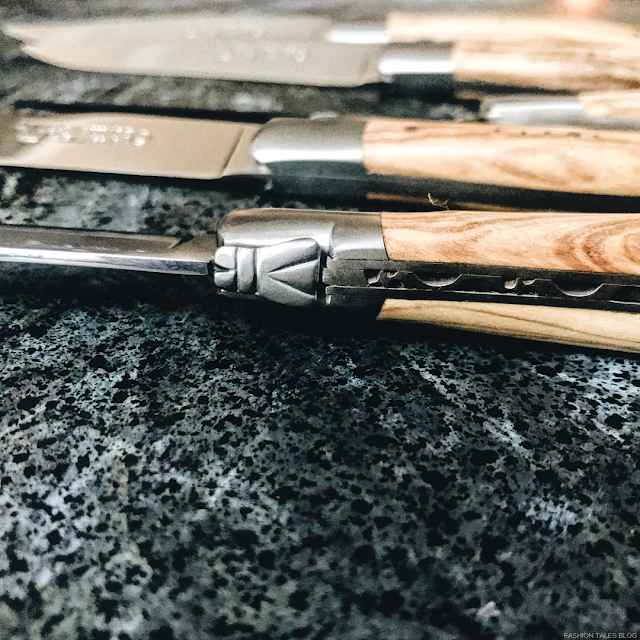 Each knife is assembled, shaped and fitted by an individual craftsman, so there's a unique artisan touch in every piece created. You really must hold these to understand how smooth and luxurious they feel in hand. The full handles are a good weight—light and sturdy enough for everyday use—to allow a proper grip around the bolsters. My favourite part of the design is the intricate file work. It's beautiful. With that being said, I don't usually lean toward such decoration when it comes to knives. However, when they have the exquisite hand-work with elaborate design as these, they certainly make you appreciate the craftsmanship in all forms. 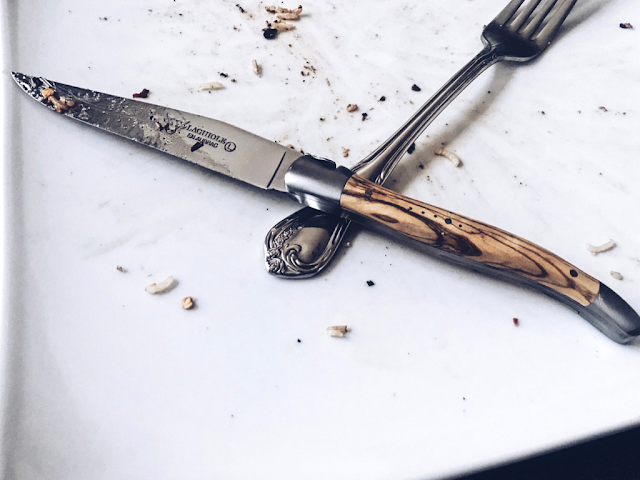 Paying homage to Laguiole knives for its acclaimed quality: Metalwork for the pieces are forged in the small village of Montézic, staying true to the traditional local cutlery methods used in each step of production. 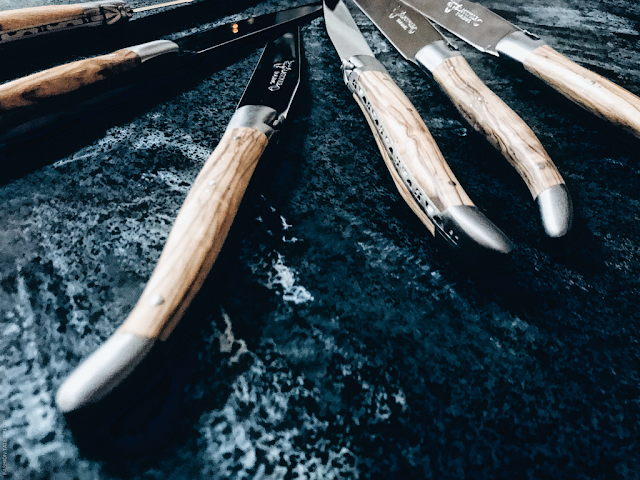 For each knife, there are 109 steps in producing a single-piece model. The range of materials used in the collection are all-natural and include juniper, ebony, and rosewood to name a few. If you're looking for a premium grade knife for everyday use, I highly recommend these. View more about the region where the knives are produced in the beautiful Aubrac countryside— traditional livestock farming and over one-thousand species of plants can be found there, due to Aubrac's enriching flora terrain. What do you think of these knives? Do you have quality cutlery? The goods: Ref 62C99OLIHL: Olivewood Knives-Courtesy of Laguiole en Aubrac. View the collection and shop other tableware from the brand here. All opinions are my own and honestly expressed.